OHAUS Corporation, a leading manufacturer of balances for industrial, laboratory, education and specialty markets worldwide, offers the Defender 3000 Series as an entry level light industrial strength bench scales to its comprehensive line of weight measurement equipment products. 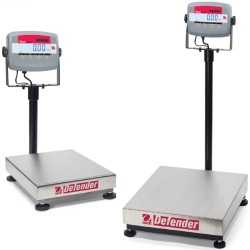 The Defender 3000 Series Bench Scales have been designed as reliable and affordable scales for use in production, packaging, and shipping and receiving areas. The Defender 3000 Series feature a simple, yet rugged, tubular-frame base design and indicators with tactile keys, backlit LCD display, built-in rechargeable battery operation and flexible mounting capabilities. The Defender 3000 Series is the solution to your weighing applications that require legendary Ohaus dependability within an affordable budget. The Defender 3000 are simple, yet rugged, bench scales that are ideal for general weighing and simple counting applications. For instance, warehouse and shipping and receiving departments can use the scales to get quick, accurate weights of boxes before shipping. Basic Level Bench Scales are ideal for general industrial use in dry applications and feature a stainless steel pan, painted steel construction with a high-impact ABS indicator. Application modes include weighing, simple parts counting, and weighs in lb, oz, lb:oz, g or kg units.